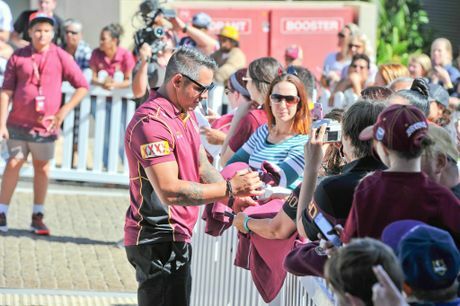 Corey Parker greets some of his fans. The Qld Maroons are here and the fans are going wild. There's a fantastic turn out on Goondoon St and the boys are more than happy to take their time, greeting the fans, signing autographs for the kids and posing for photos with the ladies. THEY'VE been around for decades, but the elderly folk at the Port Curtis Day Respite Centre have never been treated to a day like this. The ladies and gentlemen, who travelled down in a mini-bus for the once in a life-time occasion, are all loud and proud Queenslanders. Leonie Messenger, a worker at the centre, said some of the elderly had even come in especially to get a ride down to Goondoon St.
FOOTY just isn't footy without a snag. And Gladstone's talented young Barrel Racing star Maddie Goggi, with her two sisters, is taking advantage of the city's taste for footy and a sausage sizzle by setting up a stall on Goondoon St, outside Gladstone Newsagency. BARREL RACING STAR: Maddie Goggi is holding a sausage sizzle on Goondoon St to raise money for a trip to the U.S. for her sport. Ms Goggi, who is heading to the U.S. in 25 days for her sport, is doing some last minute fundraising to help her get the final $2000 she needs to pay for the trip. She was shocked by the turn out considering it's a school day and said the support from locals had been overwhelming. It's still half an hour to go until the street parade officially begins. Natalie Smith from Chris Trevor and Associates Lawyers could hardly hold down her disappointment when she learnt her beloved Jonathan Thurston wouldn't be parading down Goondoon St today. Ms Smith, and her colleagues Natalie Coe and Coleen Trevor, have been in a last minute rush to throw up Maroon's gear on the law firm's front because 'they didn't want anyone else to see what they were doing". 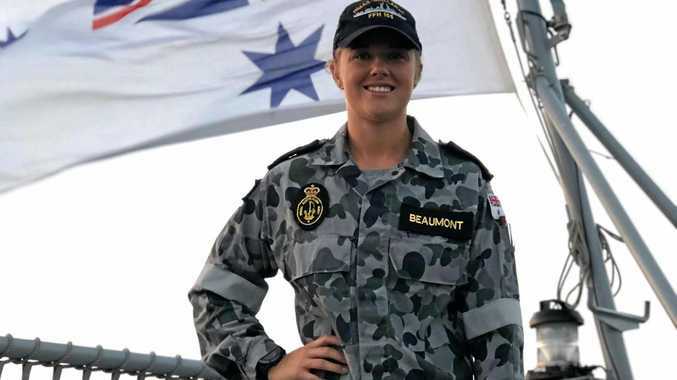 Ms Smith, who joked the girl beside JT which she has stuck to her shop window is her daughter, said the Queensland star "will be with us in spirit". THE Maroon's spirit has awoken in the heart of Gladstone this morning. Business owners and their employees have woken up bright and early to decorate their shops in maroon merchandise ahead of the Queensland side's parade at 10:30am this morning. Robin Dennis, of recruitment agency NEATO Employment services has run off with her husband's two maroon banners this morning to hang them on the shopfront windows. Robin Dennis has run off with her husband's Maroon merchandise. She's also stuck Maroon flags on the shopfront, and will soon hang out balloons. Next door, Be Pampered owner Matt Robb has been drilling up Maroon banners since the early hours of this morning. Business owner Matt Robb is hanging out his Maroon's merchandise. Detour signs have already been set up around the city's centre as Goondoon St and its side streets will come to a standstill shortly. TRAFFIC was still moving down Gladstone's Goondoon St just after 6am this morning, ahead of the Maroon's visit at 10:30am this morning. But council are expected to close these roads shortly. 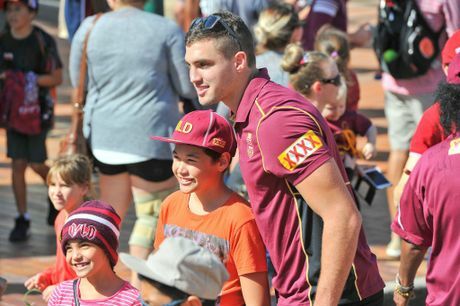 The Maroon's parade will close down Gladstone's Goondoon St.
About 10,000 people are expected to flock to the city's centre, to get a glimpse of our Queensland heroes. Police will be on the main street and surrounding streets throughout the day to ensure crowds are flowing smoothly.